Spent yesterday in a rather different milieu. I went to a modest train show in Burlington, Ont to assist my friend Brian Dickey with his British Prototype O scale layout. Basically, Trevor and spent the day shuffling wagons in and out of the fiddle yard, and switching them into various locations on the display area. All the locomotives are equipped with factory DCC sound and they run like Swiss watches. Since we're dealing with large scale items, coupling was done with 3 link chains. With a little practice hooking and unhooking became very easy. (Here's a tip) It's way easier to do when you're not laughing. British prototypes always have an appeal for me. Small locos, and all those short wagons make for really nice looking trains. And those whistles! I get sorely tempted to toss all that North American stuff and start buying fish vans. Spent some time the last few days adding scenery into the Kettle Creek Valley and into part of the yard. Adding ground cover is a multi-step process, with lot's of drying time and the occasional revisit. Over top of my "earth" coloured base, I brush a coat of Weldbond, (the glue I use gallons of) and sift a coat of Woodland Scenics burnt grass. Once that dries I scatter other greens over top in a random fashion, and securing that in place in the traditional way. Spraying with wet water and then dribbling thinned glue all over the place. Once that drys the real fun begins. STATIC GRASS! I love that stuff. I mix 3 colours of 6 mm long grasses from Noch and apply a fairly thick layer all over. I've found that just slightly thinned Welbond has the right amount of tack to grab and hold the fibers upright while the glue dries. I just brush a coat of glue in about 1' squares and add the static grass as I go. With the first layer of static grass in and secured, I reinstalled the bridge. For some reason, yet to be determined the abutments have moved closer to each other. Just enough to make the bridge not drop in, so some shaving was in order. I sure hope that come the summer I don't get a yawning canyon. And I felt compelled to pose "Tilley" and a caboose on the trestle. Just cause I could. There's more textures and ground covers to go in. Trees, bushes, etc. But with this done I can focus on less tricky areas. This gorge required that things be done in a certain order, lest I build myself into a corner. It may have been there for awhile, but I only just found it. 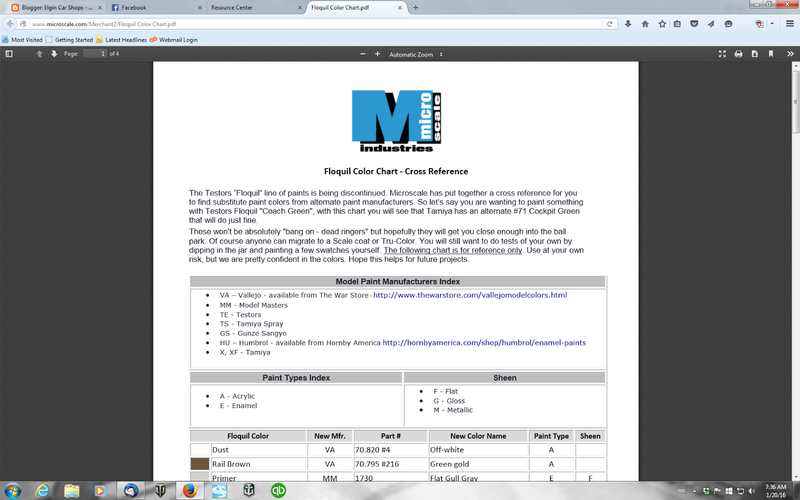 Those fine folks at Microscale have taken the time and trouble to offer up a cross-reference chart, matching the old Floquil line of paint to currently available paints. Most of the colours listed will be found in any well stocked military modeling shop. And to my delight there's a large amount of enamels. Some swear by acrylics, I swear at them. I've already made a significant purchase this week of certain colours and the testing will begin. Stock Car Chronicles, decals and done! Decaling 15 cars at once stretched not only my patience but my work space. A small shout out here is warranted to Al Westerfield. When he created the decals for this car, he did it knowing that some modelers like to build fleets of cars. As a result the number jumbles on the decal sheet allowed me to number 15 cars all with different numbers and each car`s number was done with only 2 pieces each. Thanks for thinking of me Al! No matter how you look at it, that`s a lot of stock cars. That string of cars is going to look awesome behind an NYC mikado. I can easily imagine this engine pulling those cars. First thing tomorrow, we go to the post office! And I'm taking this as affirmation of my efforts. 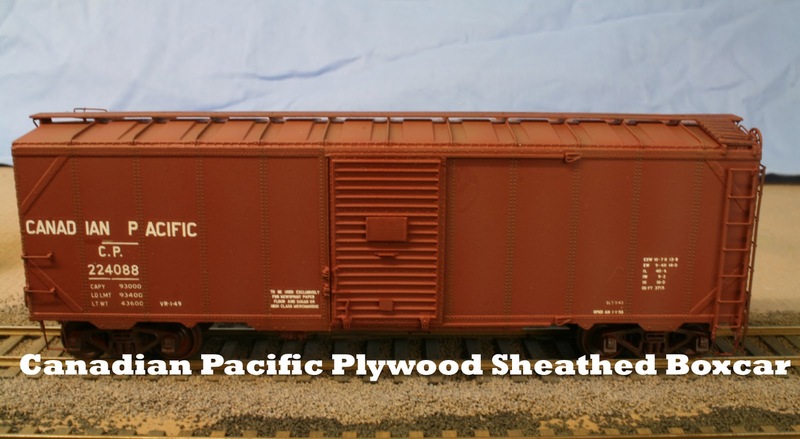 The last kit of the CPR plywood sheathed boxcar has just been sold! As a result it is the first kit that Yarmouth Model Works offers that has sold it's full and entire production run. I'm deeply indebted to so many people who made this possible, but mostly to you the customers who purchased this kit. Every resin kit release is a bit of a dice roll. 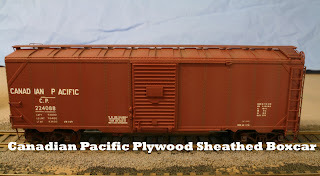 I hope that I capture the modelers imagination and interests with the items I release. And to date I seem to be succeeding. Here's to hoping that this is trend that continues for some time. Well knock me over with a feather! The other day I made a request to people to tell me about their preferences as to how to present resin reefer kits. One piece bodies, or body cores with separate ends and roofs to ease painting and eliminate masking. I fully expected an even split between the 2 approaches, but instead I got a 66% vote in favour of separate parts. Which for me confirmed my thinking about how I was thinking about tackling some future reefer kits. Some people, whose opinions I highly value, disagree with the separate part approach. And I understand their position.Will it impact sales one way or the other? I don't think so. If the car offered is desired by the modeler, it will get purchased, regardless. I spent the day, Friday , in the studios of TrainMasters TV filming a few episodes for the series "Notch 8". 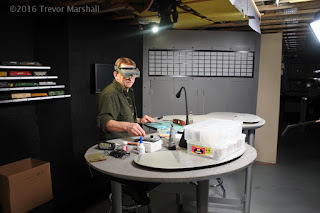 With my pal Trevor Marshall as host, we filmed 4 segments for the ongoing series that looks at somewhat more advanced modeling projects. I won't divulge more details than that, log into TMTV and see for yourself what's going on. This is not Youtube videos. TMTV is professionally filmed, high quality videos that cover so many different aspects of our hobby. While there is a fee, it's cheap entertainment. The segments filmed will be online later this year, I'm told. My thanks to Barry Silverthorn for providing the studio and the expertise to create such high quality video. Assuming you care about this question. A debate is going on within a circle of resin manufacturers regarding how best to deal with reefer kits. In particular cars with multi-color paint jobs. It's agreed that one piece bodies are required. But do we offer one piece bodies with false ends and separate roofs and floors, which will allow for multi-color paint jobs with out masking. Or do we make the bodies as complete as possible? You guys are the buyers, what's your preference? If you have not seen this question online and have an opinion on this, I would appreciate hearing from you. Please email me a short response, pierre.oliver@elgincarshops.com . In a couple of days I'll post the results. This weekend the cars got painted. At the clients request, Tru-color paint was used. They offer a whole line of prototype colours to match the various shades and hues used by the many different companies over the years. Some of the colours I really like and some of the choices I'm not so sure about. But in this case the NYC colour matches other colour mixes I've used in the past. If the formulation of Tru-color is unchanged from decades past when it was Accupaint, it's more an ink than a paint, thus it handles a little differently. There are also reports of it not adhering well to resin. In terms of handling, it thins with acetone. I find it rather thick to be sprayed straight from the bottle and since it drys so quickly, I had to stop and clean the airbrush a couple of times to eliminate clogging. But it covers well and drys gloss which is helpful for decaling. The adhesion concern was addressed by spraying Tru-color primer and letting that dry for a day. Here's hoping that takes care of that problem. As I said the paint dries very quickly, but I chose to let everything sit and cure for a couple of days. I've had issues in the past with paint outgassing under decals and creating air bubbles that I wind up spending far too much time chasing and dealing with. Actually it's time for a little me time. Stock car Chronicles, To the paint shop! So that's what a pile of 30 air hoses and brackets look like before they are mounted onto the cars. I also added retainer lines up the B end made from 0.008" wire as well as brake shafts and cut levers. The little details that escalate a model from hohum to full tilt boogie. We'll talk about paint choices later. And lets get this part very clear. They are properly called running boards, not roof walks. If you doubt me, read a Car Builders Cyclopedia. While a straight forward job, running boards can make or break a car model. They need to be carefully centred in both axis. So careful measuring and checking and rechecking is the watch word here. I tack the running boards to the stand offs at each end and make sure I'm happy with the location before adding CA at every standoff. I add a length of 1 x 2 styrene to each end to replicate the end cross brace. There is a cast resin bit included, but I feel that that part is far too thick. Some careful marking and fitting results in the running board braces mounted to the car end and the running board. Most of the cars are being built with a wood sheathed roof. The car history indicates that the NYC reroofed most these cars with a wood roof in the early 50s. Those roofs do not receive a lateral running board, while the metal sheathed roofs did. It also worth noting at this time, that the wood roofs are a replacement roof offered by Speedwitch Media. This spectacular roof was crafted, board by board, by my friend Bill Welch and it needs to be seen to be fully appreciated. Supports for lateral running boards can be a trial to create and mount. I have the advantage of having lots of etched parts lying around, so I used some supports that I had in hand. I drilled the ends and then drilled holes into the roof edges and pinned the parts in place and then simply glued the laterals in place. The corner grabs were mounted in advance of securing the laterals and I used my etched eyebolts to support the corner rather than the supplied wire eyebolts. It's worth noting at this time that Westerfield is no longer including wire eyebolts in their kits. Rather etched eyebolts from Yarmouth Model Works are part of the kits now. A little bit of self praise there. Not much left now, some B end details, airhoses and cut levers. And then we paint. As I mentioned a couple of days ago, other things have been worked on in between sessions on the stock cars. A pair of S scale coaches from MLW Services. These are mostly brass construction models of coaches owned by CNR, which roamed all over the country at one time. I'm always intrigued by S scale. It is a nice size, yet sadly doesn't have the product array of other scales. If there was more product out there, I'd be very tempted to switch scales. I've had a lot of fun operating on Trevor's layout and have spent many an hour just looking at the models. But it's highly unlikely that anyone will release high quality Wabash models in S, so I'll stick to HO. To his credit, when Al Westerfield created the patterns for these cars there were no commercially available sill steps that reflected the style that these cars carried, so Al created sill steps and cast them in resin. And they look very nice. But they are rather fragile and do not do well on layouts that have ham handed operators. And they're a royal pain to deflash. This is where our good friends at Des Plaines Hobbies come in. Some time ago they had these lovely injection molded sill steps created for MDT reefers. And they're a perfect match to the stock car steps. That I've been so deep into the stock car project that I might be loosing my mind, just a little. Have no fear, there are a couple of other projects that have been worked on as well. This is 3 of four brass reefers I just painted for a client. They just got boxed and shipped out this afternoon. Very nice Overland 50' SFRD reefers. The decals were a mix of Sunshine, Champ and some one else I can't recall now. A pleasant diversion from the stock cars. The only real drag was the Champ decals. They were showing their age and cracking as I tried applying them. Liquid decal film came to the rescue, but a few choice words were uttered. There's another large project finishing up as well. More on that when it's done. Springfield 2016, not for me. 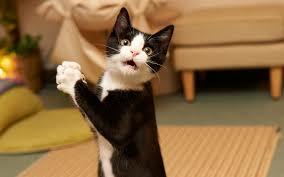 After careful consideration, I've decided that I will not be attending the Springfield Railroad Hobby Show. Between the fights with the US border types, an ongoing dispute with Mass tax department and the perils of January weather across upper New York State, I've had enough. To all of my friends who I usually get to see there, I'm sorry. I will miss seeing you. Particularly the "Dead Railway Society" and the annual feast of tatonka. I will focus my traveling budget on RPMs instead. See you in CT next. That's been the byword for the latest step. With over 450 grabirons to install, I'm not interested in wasting hardware. Most of the drop grabs supplied by Westerfield are not fully formed. The drop portion should be fully perpendicular to the mounting shaft, but for years now the drop grabs from Westerfield have been as above. It's easy enough to fix. I just clamp them in a pair of square nose pliers and complete the bend. Easy. I could have tossed the supplied grabs and used Tichy grabs, but 450 grabs is a lot of hardware to toss. With the grabs now the desired shape, the holes are drilled and the grabs attached. I use strips of styrene to help maintain consistent spacing from the sides. We're getting closer. I might be painting this coming weekend.